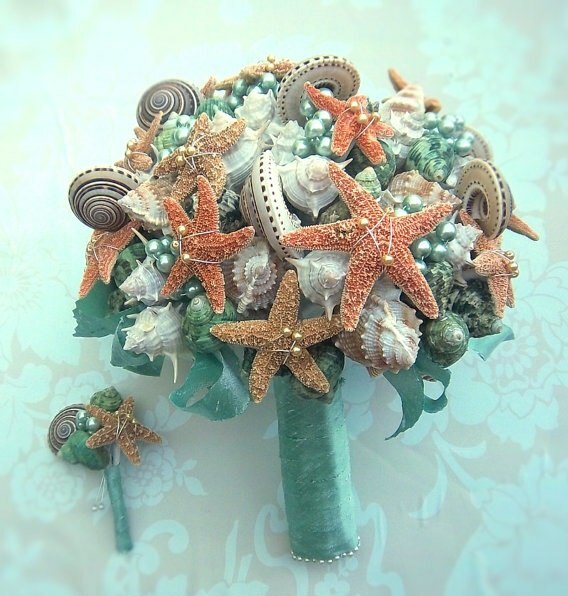 The sea has always fascinated us with its beauty and mysteries that are hidden in its depths. 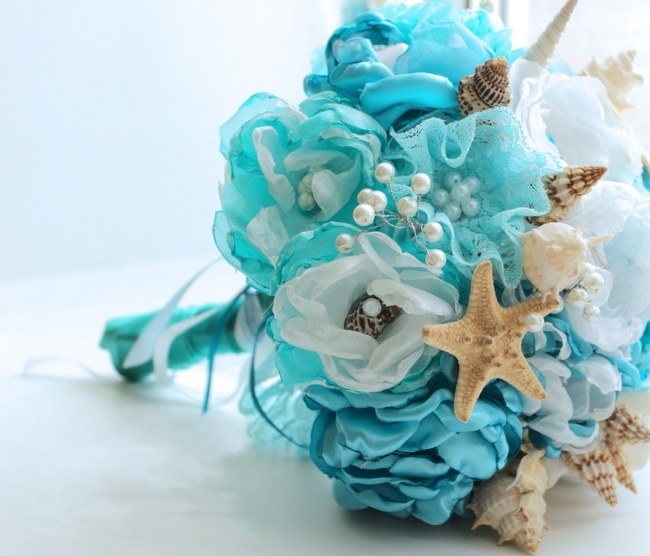 According the legend Aphrodite, the Greek goddess of love and beauty, was born from sea foam. 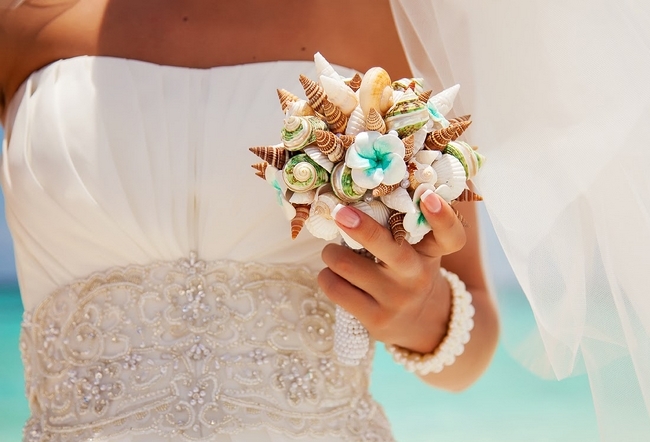 She was married to Poseidon, the God of Sea, who gave her a big seashell as a gift representing their love for each other. 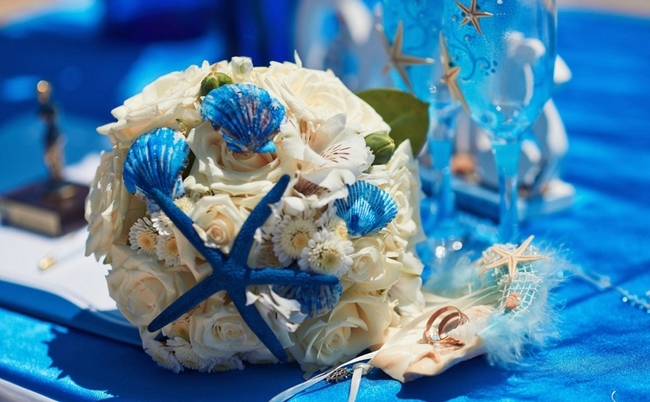 You’ve probably seen the famous painting by Botticelli where Aphrodite is standing on a big scallop. 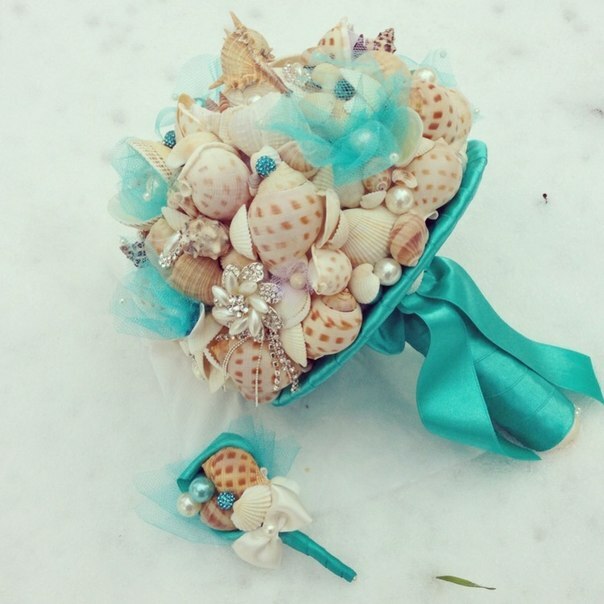 If you are planing a beach wedding or a wedding with nautical theme, then you’ll definitely like this romantic symbolic meaning of the seashells. 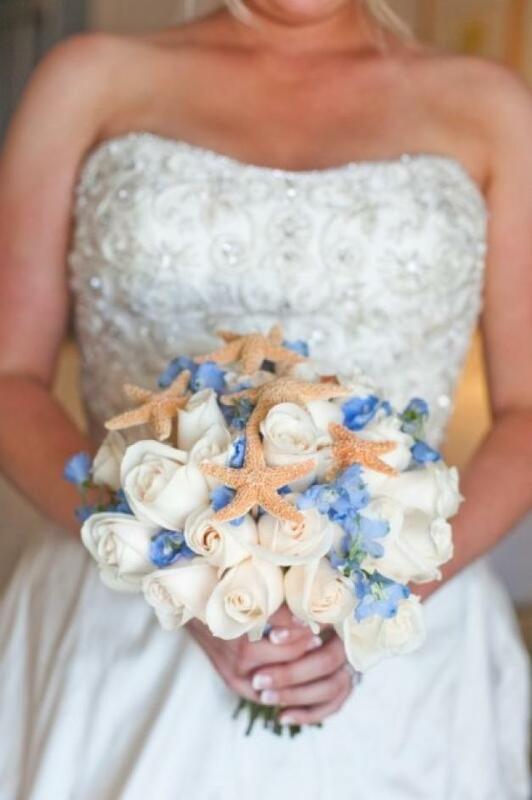 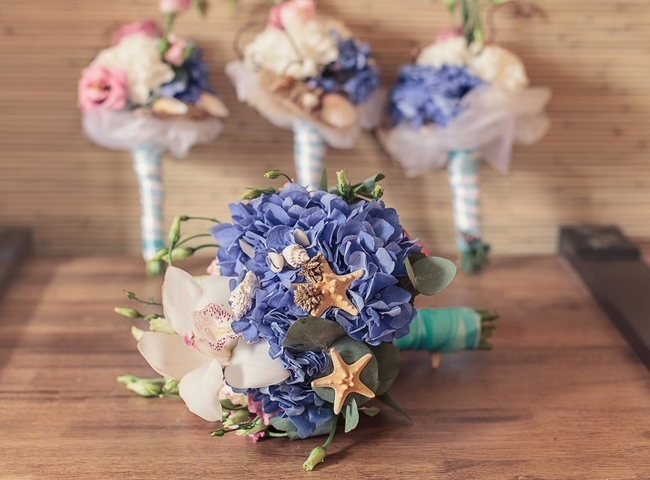 Seashell bridal bouquets are a new trend in non floral wedding bouquets which have gained much in popularity due to their durability and unique, natural look. 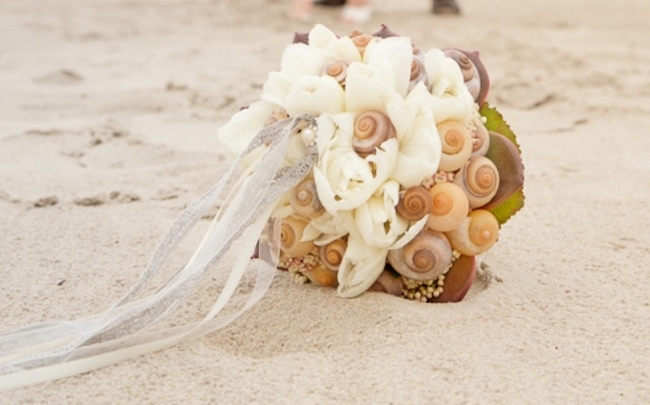 If you are looking for unusual beach wedding bouquet ideas, then consider incorporating these “gifts of nature” into your bridal bouquet! 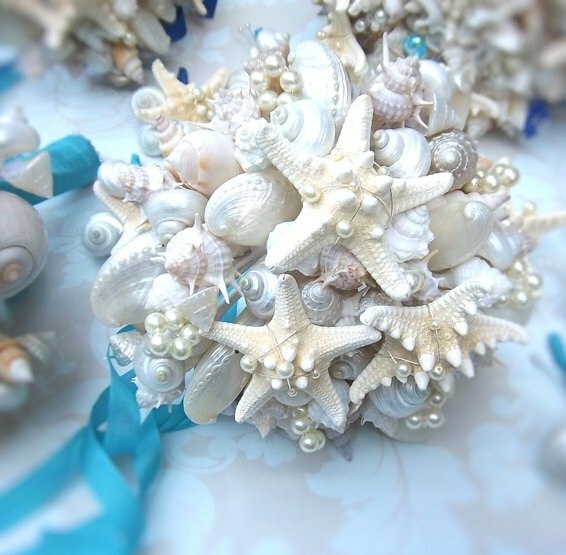 Seashell bouquets are not hard to make, if you are a skilful crafty person with a glue gun 🙂 . 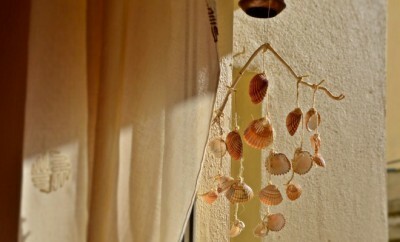 The shells are glued to wood skewers or wires, that are flexible and can be twisted and curved. 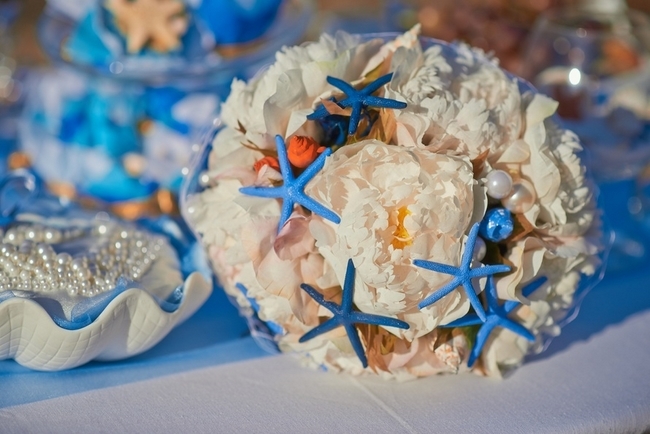 Then inserted into a floral foam ball. 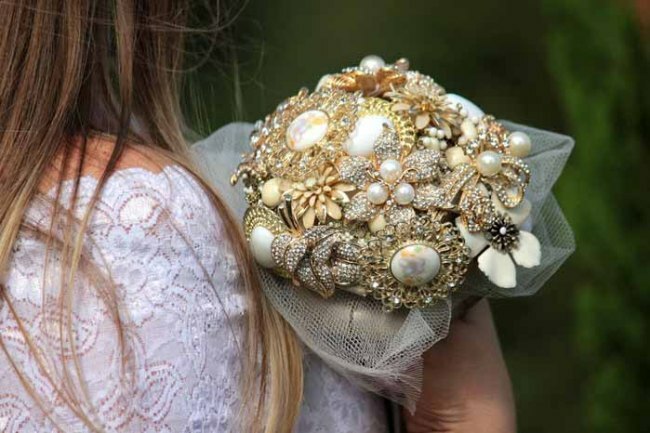 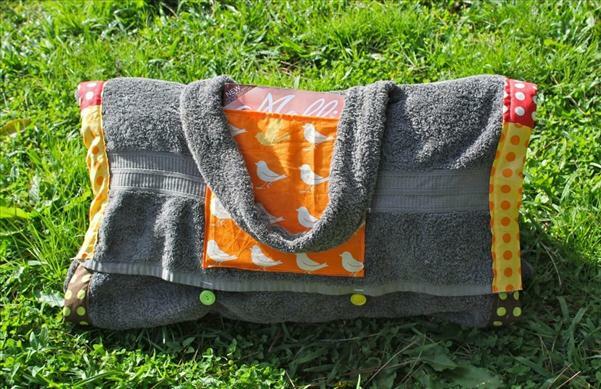 The gaps are filled with pearls, brooches and other embellishments. 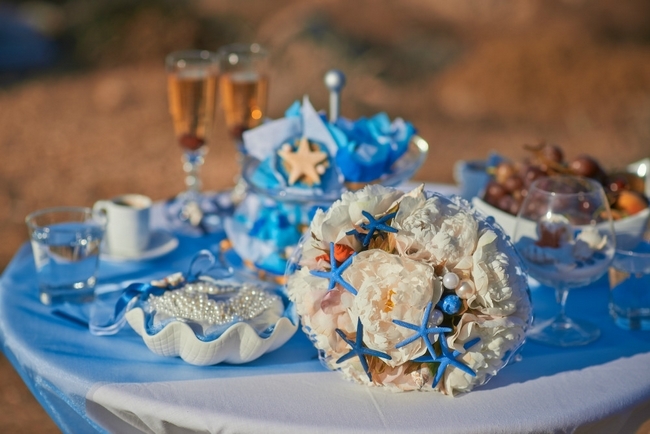 Attach the floral foam ball to a “stem” made of wood skewers but draped with a ribbon. 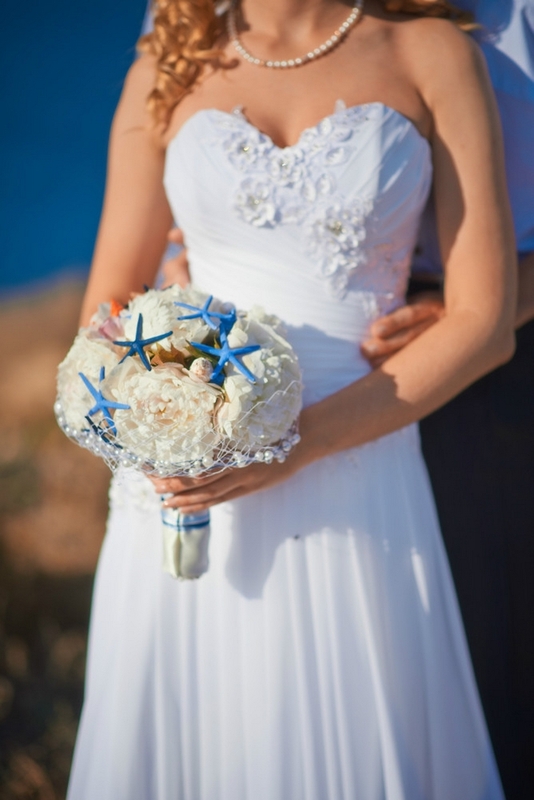 You can also search for a bouquet holder with floral wet foam for fresh flowers on top. 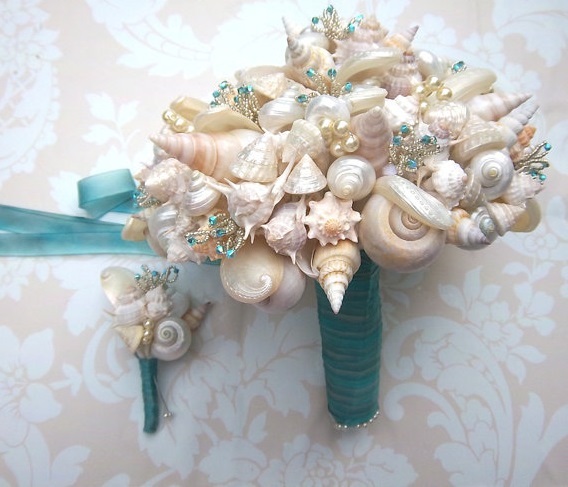 If you can’t do it yourself, then trust a professional and have a look at the gorgeous handmade seashell wedding bouquets on Etsy. 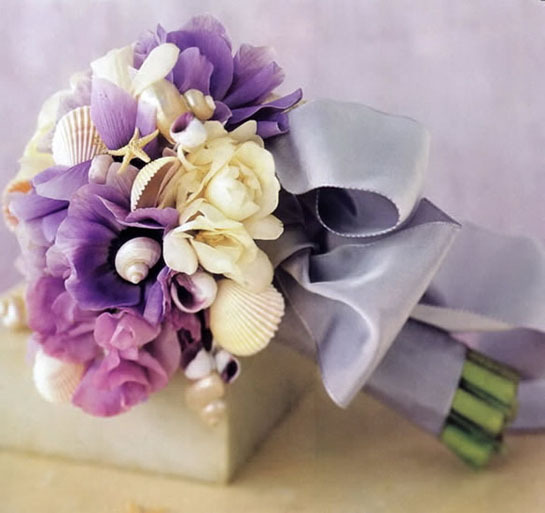 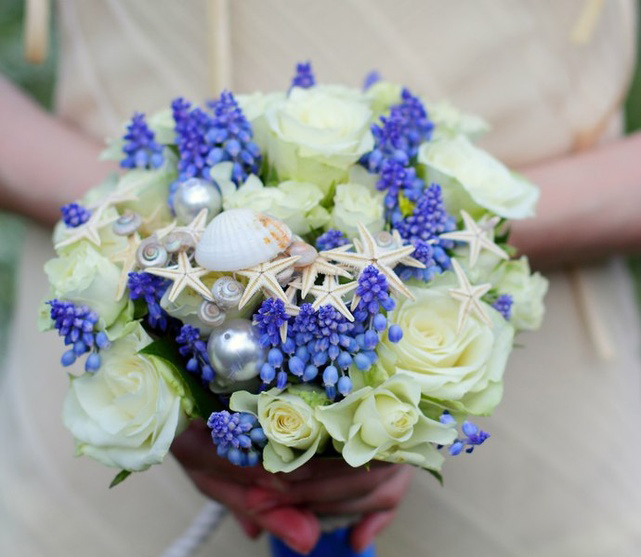 If you don’t really want to exclude completely the flowers from your bridal bouquet then we have another idea for you – beach wedding bouquet ideas where seashells are only the finishing touch. 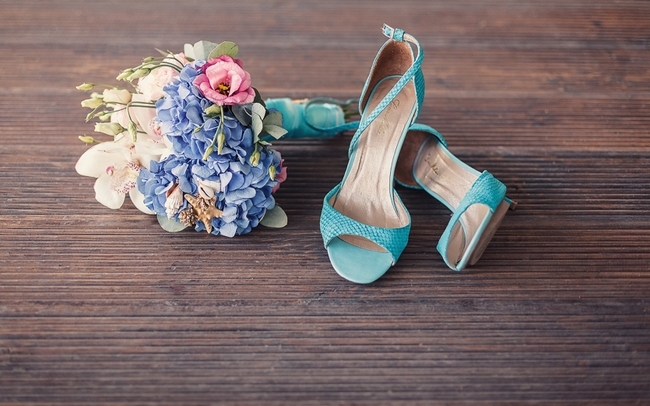 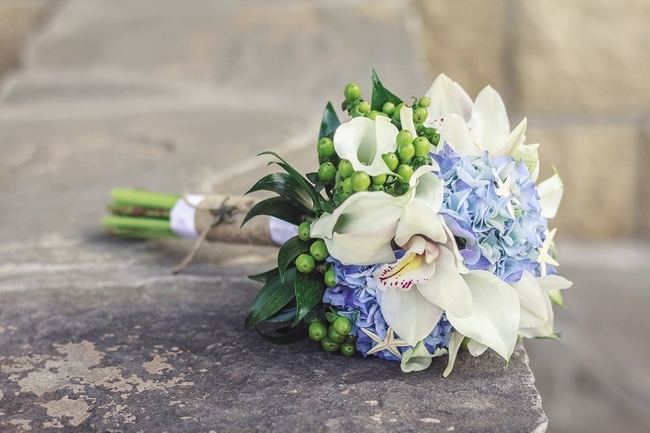 With their huge blooms and lovely colors, hydrangeas and peonies are perfect for beach weddings. 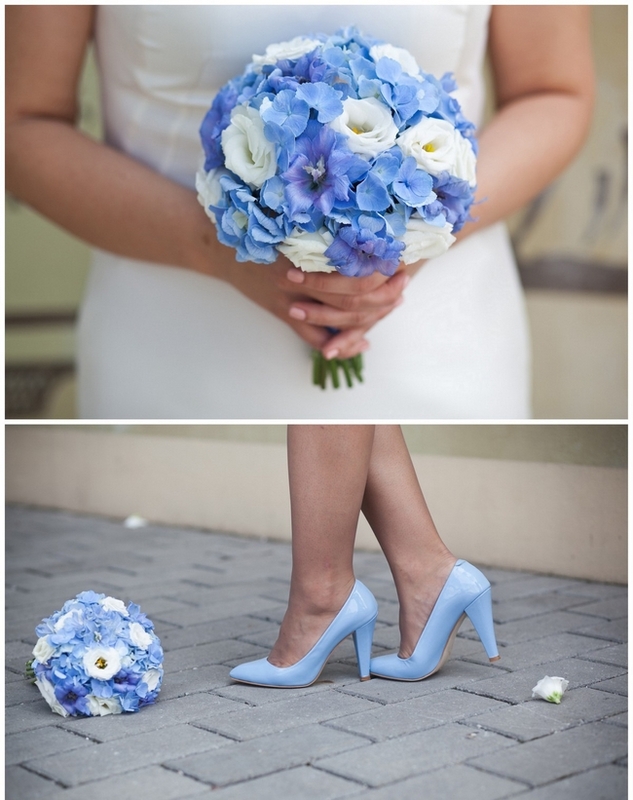 They are blooming all summer long and are matching the Blue & White color scheme. 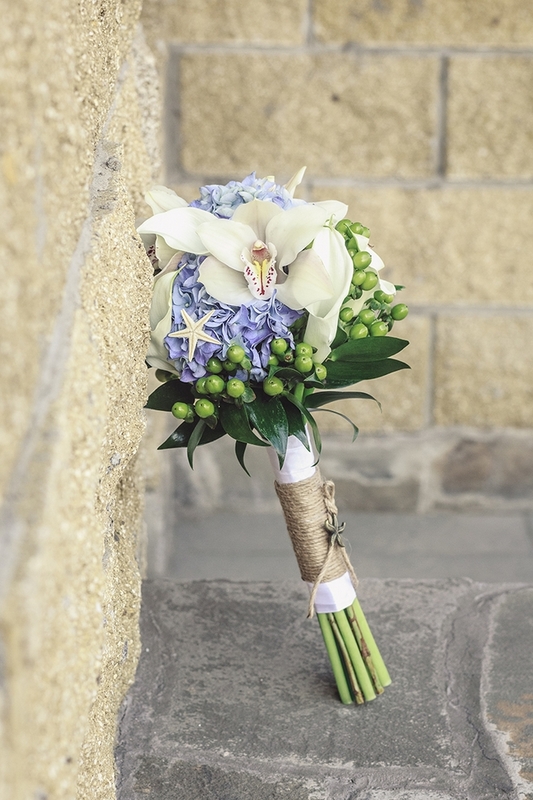 White roses and blue forget-me-not flowers, daisies and grape hyacinths, white orchids and blue hydrangeas are another great combos.